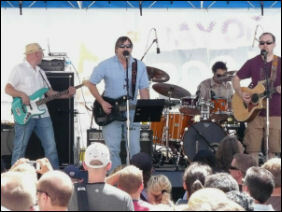 The Samples played on the Welton Street Stage on the 16th Street Mall in Denver. The event was The Day of Rock, Concerts For Kids. This was the third year for the event held on Memorial Day weekend. The stage was set up on Welton Street, facing 16th Street. It was the most isolated stage, which I think was a good thing because it reduced the sound bleed from the other four stages. By the time the band took the stage there was a good sized crowd waiting to hear The Samples. It was warm and sunny and the crowd was ready for some music. The Samples sound checked with "Weight of the World" about 15 minutes before their 2:50 PM scheduled start time. The sound was crisp and clear, but there was a little too much snare drum in the mix. After an introduction by KOSI-FM After Dark host Rashke, the Samples started their set with "Little Silver Ring." This is the Samples most recognizable song. "Little Silver Ring" just has that classic Samples sound to it. With Sean Kelly's strong and instantly recognizable vocal and signature guitar sound it was a good start for the set. Next up was "The Streets in the Rain" also from "The Last Drag" CD. Sean connected the song to the event by telling the crowd that the Samples played the same event last year and it rained. The song was well played but not a highlight for me. "Wild River (Colorado)" started with some of the band members and crew tossing CDs into the crowd. I thought the saxophone introduction to the song worked very well. This reminded me of the Brian "Snowman" Powers era of The Samples when they had a full-time sax player in the band. The pre-recorded bird calls through the PA system signaled the beginning of "Nature." For me, this song was the heart of the set. Hearing Sean play those diving whammy bar guitar lines is what The Samples are all about for me. I really enjoyed hearing "Nature" played outside in the heart of downtown Denver. Before starting "Did You Ever Look So Nice?" Sean told us it would be the last song of the set. Wow, the 45 minutes flew by so fast. This song dragged a little for me, especially since Sean didn't play during the middle section of the song. The past few times I've seen them play the song, Sean looped a guitar part and took pictures of the crowd while the band kept the song going. So, this wasn't unexpected, but I would rather hear him play guitar than watch him take pictures. I recorded The Samples close to the stage and almost perfectly centered. I used Microtech Gefell M300's and a pair of spaced CAD e70 microphones with omni-directional capsules. I like the M300's recording better, so that's the recording I uploaded.